Salem... an exciting place to visit! Harbor Sweets... fun to see! Salem enjoys one of New England's highest concentrations of historic sites, museums and cultural activities, in addition to fine dining and great shopping... and plenty of "witch activity" too. People come from around the world to see the House of the Seven Gables. The Peabody-Essex Museum is considered the jewel of America's maritime museums. There's the 1630 Pioneer Village and now for the first time, visitors can see the new Friendship, a 171-foot replica of a three-masted, square rigged, "East Indiaman", originally launched (close to our candy factory) in 1799. 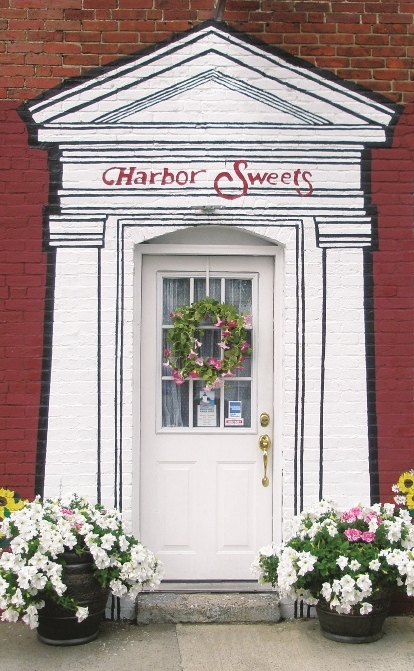 Harbor Sweets is a short walk from most of Salem's historic sites. When you visit us, you'll receive a sample of your favorite Harbor Sweet. To Join Our Email List, please enter your email at the bottom of the page. COME TOUR HARBOR SWEETS CHOCOLATE FACTORY! Tours are given on most Tuesdays and Thursdays at 11:00 AM. It's best to call us for information. 1-800-234-4860. From Boston you can follow either the 1A North directions or the 128 directions. Take exit 25A to Route 114 East, towards Salem and Marblehead. Follow 114 for about 3 miles through Peabody and into Salem. Route 114 will become Lafayette Street. Take 3rd left onto Leavitt Street. You will see the Berube Funeral Home on the corner of Leavitt St. It is white with green shutters and awnings. Follow to the end of Leavitt. Harbor Sweets is a red brick building on the left at the end, #85. Follow 1A North into Salem. When you come to the intersection where Salem State College is on your right, turn left. You will now be on Lafayette St. (the continuation of 1A). Follow Lafayette St. to Leavitt St. It is the 8th side street on your right, just after the Saltonstall School. Turn right onto Leavitt St. and follow to the end. Harbor Sweets is a red brick building on the left at the end, #85. Follow 1A South into Salem to the intersection of Congress and Derby Streets, just past the Hawthorne Hotel. At the intersection of Congress and Derby Streets, go straight to the end. You will pass Pickering Wharf on your left. At the "T", go left onto Leavitt. Harbor Sweets is on the left in a red brick building, #85. Follow 114 (also Lafayette Street) into Salem. About a half a mile past Salem State take a right onto Leavitt Street, the 8th side street, and follow to the end. Harbor Sweets is a red brick building on the left at the end, #85.